Standard Duty Detent Pins are ideal for basic holding and removal applications that don't require a positive locking ball feature. Body (Shank) is CRES 303 Stainless with CRES 316 stainless spring & ball. Pins are activated by push or pull motion. 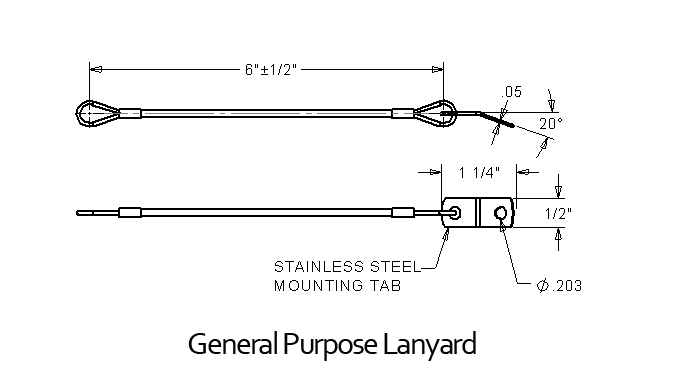 Includes split ring for attachment of optional general purpose lanyard. Optional materials, sizes, and styles available. Part Numbering: Specify the six digit standard detent pin number followed by the 3 digit suffix (i.e. 804614 - L12 - 1/4" x 2" pin with 12" lanyard attached to ring).